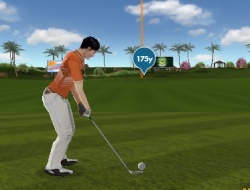 All the best golfers have shown up in this miniclip golf game and you will be one of the participants and your goal is to of course win the trophy and show off your skill on each shot you take. There will be plenty of clubs to choose from but every time you approach the ball you must consider the speed of the wind and its direction the choose the angle and power of the shot. Try to put the ball in the hole in as few shots as possible if you want to make your score a well below negative one and defeat the masters of this classy sport. Golf Champions 0.00 between 0 and 10 based on 0 votes.